You breathe a spirit as warm and large as Walt Whitman’s. I salute you as one of the good, Honest men of the earth, one we shall always be proud of. 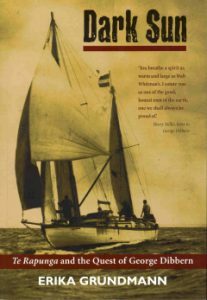 Dark Sun recounts the life of German-born Georg Johann Dibbern (1889-1962)—the controversial, free-spirited vagabond, visionary sailor-philosopher, author of Quest, friend of American writer Henry Miller—and of the extraordinary women (like Dibbern ahead of their time) who shared his life. Refusing to live as a sheep in the herd he defied conventionality and broke free in 1930, with his conscience as his only guide. He took a stand against Nazism, in 1937 creating his own flag, then his own passport which was notarized in San Francisco, USA, in 1940. With these symbols of his personal beliefs, admired by some, scorned by others, he dared to sail his 32 foot ketch Te Rapunga (the third of eighteen steps in the New Zealand Maori creation myth, that pre-dawn, dark sun moment signifying “longing” or “seeking”) in his mission to build bridges of international brotherhood and friendship—not without consequences to himself (including a second internment in New Zealand) and to the family he left behind in Germany. The result of ten years of research, this absorbing biography of the adventurous author of Quest—the book that won the respect and praise of Henry Miller—reads like a carefully-crafted and spell-binding novel.